Our muffin recipe at The Providores has evolved slowly over the years to reach this version. You can replace the banana with chunks of poached winter fruit, or fresh berries in summer, but whichever way, they're really good. Preheat the oven to 190°C/gas 5. Line 12 100ml muffin tins with squares of baking parchment or muffin cases. Sift the flour, sugar, raising agents and ground ginger into a large bowl with two pinches of salt. In another large bowl briefly whisk together the egg, oil, buttermilk, orange zest and stem ginger. Stir in the mixed dry ingredients and poppy seeds until just combined. Slice the bananas into ½cm-thick coins. Set 12 pieces aside and fold the rest into the muffin mix with the chocolate. Divide the mixture between the tins, then push a piece of the reserved banana into the centre of each; sprinkle with the demerara sugar. Bake on the middle shelf of the oven for around 18–22 minutes, until a skewer comes out clean from the centre of the muffins. Leave to cool for 10 minutes in the tins then tip out. They will keep for a few days: store them in an airtight container, then warm gently in the oven for a few minutes to refresh. 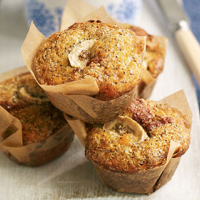 The spicy style of Ethiopian coffee takes well to a dash of breakfast milk, but it still has plenty of flavour in hand for these vivacious muffins.